It is known by many names: Gehenna, Apocalypse, Ascension. For millennia, humanity and its supernatural masters have wondered at and dreaded the nature of the End Times. Now the signs are unmistakable - the oldest fears of the prophets are about to be realized. Will it be annihilation? Or does new hope await beyond this great darkness? 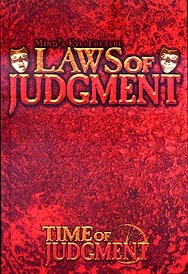 Laws of Judgment is a comprehensive guide to presenting the Time of Judgment for all of the Mind's Eye Theatre games. Everything players and Storytellers need is contained within, from new rules and systems born of the End Times to ready-made doomsday scenarios to storytelling advice on how to give a chronicle the end it deserves. Only one question remains: How will your troupe face the end?